Comprehensive review of Vita Liberata Fabulous Tinted Self Tanning Lotion. See what real experts and actual users have to say about this self tanning product. Overall, I gave Vita Liberata Fabulous Tinted Self Tanning Lotion 2.5 out of 5 stars. The color this one gives is more like a gradual tanner. It gave me a light tan after one application. You’d definitely have to apply this one a few days in a row to achieve a dark tan. And it is SO expensive to do that. Plus the bottle is only 3.3 ounces, so you’d use it all up in like a week. It smells like DHA, even though they say it has no scent. The application process wasn’t bad, especially if you use a mitt. I found it easy and not messy. The drying time is also pretty average. Overall, I gave this self tanner 2.5 out of 5 stars. 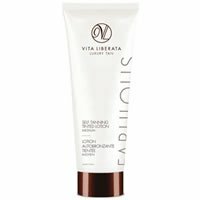 Vita Liberata Fabulous Tinted Self Tanning Lotion is a light, slick lotion that has a dark brown guide. The texture is very smooth and slick. This self tanner glides on pretty smoothly. It is however, difficult to blend the guide completely in. I think due to the texture, it ends up looking streaky even though I evenly applied it. Applying this lotion didn’t take too long when I used a tanning mitt. The lotion was easy to blend in and the slick texture helped me apply it quickly without having to rub in too long. Drying time for this self tanner was pretty average. It dried in about 25- 30 minutes. While I waited for it to dry I had to be super careful not to touch anything because this guide stains. Vita Liberata Fabulous Tinted Self Tanning Lotion smells like DHA. They claim it doesn’t have a smell, but I really don’t know where they get that nonsense. The DHA smell starts out light, but it gets stronger as you tan develops. As my tan developed the DHA smell became stronger. They say this formula includes an “odour remove technology”, but I don’t think it really works. They could’ve used some fragrance in there to help cover up the DHA smell. The color I got from this lotion was more like a gradual tanner. After I showered off the guide I had a very subtle, light to medium shade tan. The color was nice, although it looked a little yellow on my skin tone. You’d definitely need to apply the one more than once to achieve a noticeable tan. For those of you who are only looking for a light tan, I think this would give you okay results. The tan I got was even and had minimal streaking, but I just didn’t think it was dark enough and was too yellow for me personally. My light tan lasted about 3-4 days. The good news is it faded very evenly and I didn’t become streaky. Vita Liberata Fabulous Tinted Self Tanning Lotion is $8.88 per ounce! That’s super pricey, especially factoring in you’ll have to apply it a lot due to the light color. To buy Vita Liberata Fabulous Tinted Self Tanning Lotion, Click Here. Look and Feel This is a thin, slick dark brown lotion. Application Applying isn’t too bad, but be careful with the guide. Drying Time It took 25-30 minutes to dry. Smell (Before) Smells bad, like DHA. So much for their “Odour Remove Technology”. Smell (After) The DHA smell grew stronger until the next morning. Color Produced My tan was a light, yellow color. It was more like a gradual tan. How Long It Lasts It lasted only 3-4 days. Price It’s $8.88 per ounce which is really expensive.